Save on your next NORVIR prescription. Affordability of medications is a barrier that can keep HIV-1 patients from taking their treatment regimens—the NORVIR Savings Card can help. Save immediately by taking this offer with your NORVIR prescription to your pharmacist. 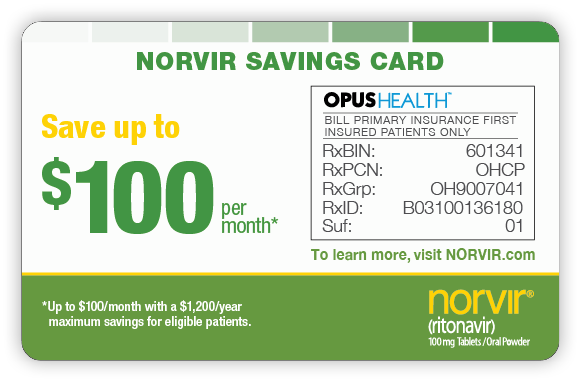 Keep this savings card and get instant savings every time you refill a NORVIR prescription. No NORVIR Savings Card? No problem! Patients who have not received a card through the NORVIR Savings Program, or for whom the card isn't working, may still be eligible for savings using the NORVIR rebate form. Eligible patients can use this form to submit a reimbursement claim for NORVIR prescriptions. Build your own resource network with connections you'll get at this link. Don't worry about running low! If your NORVIR prescription is currently for a 30-day supply, ask your healthcare provider for a 90-day supply. *Patients with commercial prescription insurance. †Eligibility: Available to patients with commercial prescription insurance coverage for NORVIR who meet eligibility criteria. Copay assistance program is not available to patients receiving prescription reimbursement under any federal, state, or government-funded insurance programs (for example, Medicare [including Part D], Medicare Advantage, Medigap, Medicaid, TRICARE, Department of Defense, or Veterans Affairs programs) or where prohibited by law or by the patient's health insurance provider. If at any time a patient begins receiving prescription drug coverage under any such federal, state, or government-funded healthcare program, patient will no longer be able to use the NORVIR Savings Card and patient must call OPUS Health at 800.364.4767 to stop participation. Patients residing in or receiving treatment in certain states may not be eligible. Patients may not seek reimbursement for value received from the NORVIR Savings Program from any third-party payers. Offer subject to change or discontinuance without notice. Restrictions, including monthly maximums, may apply. This is not health insurance. Please see full Terms and Conditions. Pharmacist Instructions: Please submit the copay card authorized for all commercially insured patients by the patient's primary insurance as a secondary transaction to OPUS Health. When you use this card, you are confirming that you have not submitted and will not submit a claim for this prescription for reimbursement under any federal, state or government-funded healthcare program, such as Medicare (including Part D), Medicare Advantage, Medicaid, Medigap, Veterans Affairs, the Department of Defense, or TRICARE. Pharmacists with questions, please call OPUS Health at 800.364.4767. ‡By texting "SAVE" from your phone to the above number, you confirm that you are 18 years of age or older and consent to receive recurring text messages from AbbVie, including service updates, medication reminders, and marketing messages. Message and data rates may apply. Your consent is not a condition of receiving goods or services. You can reply HELP for help or text STOP to unsubscribe at any time. Learn more about the Use and Important Safety Information for NORVIR. NORVIR® (ritonavir) tablets and oral solution are prescription medicines each used with other antiviral medicines to treat people with human immunodeficiency virus (HIV-1) infection. NORVIR® (ritonavir) oral powder is a prescription medicine that is used with other antiviral medicines to treat children with HIV-1 infection. What is the most important information I should know about NORVIR? Who should not take NORVIR? Do not take NORVIR if you or your child are allergic to ritonavir or any of the ingredients in NORVIR. Do not take NORVIR if you or your child take any of the following medicines: alfuzosin; ranolazine; dronedarone; colchicine, if you have kidney or liver problems; lurasidone; pimozide; amiodarone; ergot-containing medicines, including dihydroergotamine mesylate, ergotamine tartrate, methylergonovine maleate; cisapride; flecainide; lovastatin; simvastatin; sildenafil (REVATIO®), only when used for treating the lung problem pulmonary arterial hypertension (PAH); triazolam; midazolam, when taken by mouth; propafenone; quinidine; St. John’s Wort (Hypericum perforatum) or a product that contains St. John’s Wort; voriconazole, if your NORVIR dose is 400 mg every 12 hours or greater. Serious problems can happen if you or your child takes any of these medicines with NORVIR. What should I tell my healthcare provider before taking NORVIR? Before you take NORVIR, tell your healthcare provider if you or your child have liver problems, including hepatitis B or hepatitis C; heart problems; high blood sugar (diabetes); or bleeding problems or hemophilia. Before you take NORVIR, tell your healthcare provider if you are pregnant or plan to become pregnant, are taking hormonal birth control, or are breastfeeding. Tell your healthcare provider if you become pregnant during treatment with NORVIR. NORVIR oral solution contains alcohol. Do not take NORVIR oral solution during pregnancy, as there is no known safe level of alcohol exposure during pregnancy. If you take a hormonal birth control, use another effective form of birth control or an additional barrier method of birth control during treatment with NORVIR. NORVIR may reduce how well hormonal birth control works. Do not breastfeed. NORVIR can be passed to the baby through your breast milk. Also, mothers with HIV-1 should not breastfeed because HIV-1 can be passed to the baby in the breast milk. Talk to your healthcare provider about the best way to feed your baby. If you take NORVIR during pregnancy, you should talk with your healthcare provider about how you can take part in an Antiretroviral Pregnancy Registry. Tell your healthcare provider about all the medicines you take, including prescription and over-the-counter medicines, vitamins, and herbal supplements. Some medicines interact with NORVIR. Keep a list of your medicines to show your healthcare provider and pharmacist. Ask your healthcare provider or pharmacist for a list of medicines that interact with NORVIR. Do not start taking a new medicine without telling your healthcare provider. Your healthcare provider can tell you if it is safe to take NORVIR with other medicines. NORVIR oral solution contains a large amount of alcohol. If a toddler or young child accidentally drinks more than the recommended dose of NORVIR, it could make him/her sick from too much alcohol. Go to the nearest emergency room right away if this happens. What are the possible side effects of NORVIR? Liver problems. Some people taking NORVIR in combination with other anti-HIV medicines have developed liver problems, which may be life-threatening. Your healthcare provider should do regular blood tests during your combination treatment with NORVIR. If you have chronic hepatitis B or C infection, you have an increased chance of developing liver problems. Tell your healthcare provider right away if you have any of the following signs and symptoms: loss of appetite, pain or tenderness on your right side below your ribs, yellowing of your skin or eyes, or itchy skin. Inflammation of your pancreas (pancreatitis). NORVIR can cause serious pancreas problems, which may lead to death. Tell your healthcare provider right away if you have nausea, stomach (abdomen) pain, or vomiting, as these may be signs of pancreatitis. Allergic reactions. Allergic reactions can become severe and require treatment in a hospital. Call your healthcare provider right away if you develop a rash. Stop taking NORVIR and get medical help right away if you have any of the following symptoms of a severe allergic reaction: trouble breathing; wheezing; dizziness or fainting; throat tightness or hoarseness; fast heartbeat or pounding in your chest (tachycardia); sweating; swelling of your face, lips, or tongue; muscle or joint pain; blisters or skin lesions; or mouth sores or ulcers. Changes in the electrical activity of your heart called PR prolongation. PR prolongation can cause irregular heartbeats. Tell your healthcare provider right away if you have symptoms such as: dizziness, lightheadedness, feel faint or pass out, or abnormal heartbeat. Increase in cholesterol and triglyceride levels. Treatment with NORVIR may increase your blood levels of cholesterol and triglycerides. Your healthcare provider should do blood tests before you start your treatment with NORVIR and continue them regularly to check for an increase in your cholesterol and triglyceride levels. Diabetes and high blood sugar (hyperglycemia). Some people who take protease inhibitors, including NORVIR, can get high blood sugar (diabetes), or your diabetes can get worse. Tell your healthcare provider if you notice an increase in thirst or urinate often during treatment with NORVIR. Change in body fat can happen in some people who take HIV-1 medicines. These changes may include an increased amount of fat in the upper back and neck (“buffalo hump”), breast, and around the middle part of your body (trunk). Loss of fat from the legs, arms, and face may also happen. The exact cause and long-term health effects of these conditions are not known. Increased bleeding for hemophiliacs. Some people with hemophilia have increased bleeding with protease inhibitors, including NORVIR. The most common side effects of NORVIR include: diarrhea, nausea, vomiting, upper and lower stomach (abdominal) pain, tingling feeling or numbness in hands or feet or around the lips, rash, and feeling weak or tired. These are not all of the possible side effects of NORVIR. Call your healthcare provider for medical advice about side effects. You may report side effects to the FDA at 1-800-FDA-1088. References: 1. OPUS redemptions data. January 2016–February 2018. 2. NORVIR [package insert]. North Chicago, IL; AbbVie Inc. Please see the full Prescribing Information for NORVIR tablets, oral solution and oral powder. If you have any questions about AbbVie's NORVIR.com website that have not been answered, click here. This website and the information contained herein is intended for use by US residents only, is provided for informational purposes only, and is not intended to replace a discussion with a healthcare provider. All decisions regarding patient care must be made with a healthcare provider and consider the unique characteristics of each patient. Do not take NORVIR with certain medicines, as these can cause serious or life-threatening problems such as irregular heartbeat, breathing difficulties, or excessive sleepiness. Do not take NORVIR if you have had a serious allergic reaction to any of its ingredients. Some patients taking NORVIR may develop liver and pancreas problems, which can cause death. Patients may develop large increases in triglycerides and cholesterol, diabetes, high blood sugar, changes in body fat, increased bleeding in people with hemophilia, allergic reactions, and/or changes in heart rhythm. You may develop signs and symptoms of infections that you already have after starting anti-HIV medicines. Please see the Important Safety Information for more details. Based on your answer to the question, you are not eligible to receive the NORVIR Savings Card. The NORVIR Savings Card is not available to individuals who are paying cash for their prescription or who are receiving prescription reimbursement under a state or federally funded insurance program. Based on your answer to the question, you are not eligible to submit a rebate form for your NORVIR prescription.